GRAIN FREE and NO ARTIFICIAL ADDITIVES or PRESERVATIVES: A Cotswold RAW diet guarantees quality ingredients , no high temperature processing and no fillers or grain. The meat is natural and fresh with no artificial additives or preservatives. COAT, SKIN AND JOINTS: Cotswold RAW provides everything your dog needs in a highly bio-available form by providing essential minerals and vitamins in their natural form. If pet owners feel they need to provide a particular vitamin, searching which foods contain that particular supplement is a much better option rather than reaching for artificial supplements. RAW MEATY BONES: Dogs fed raw meaty bones rarely stuffer from runny stools. bones are full of nutrients, that are vital to your dog’s health. Meaty bones are nature’s toothbrushes and help to keep your dog’s bones clean and gums healthy. 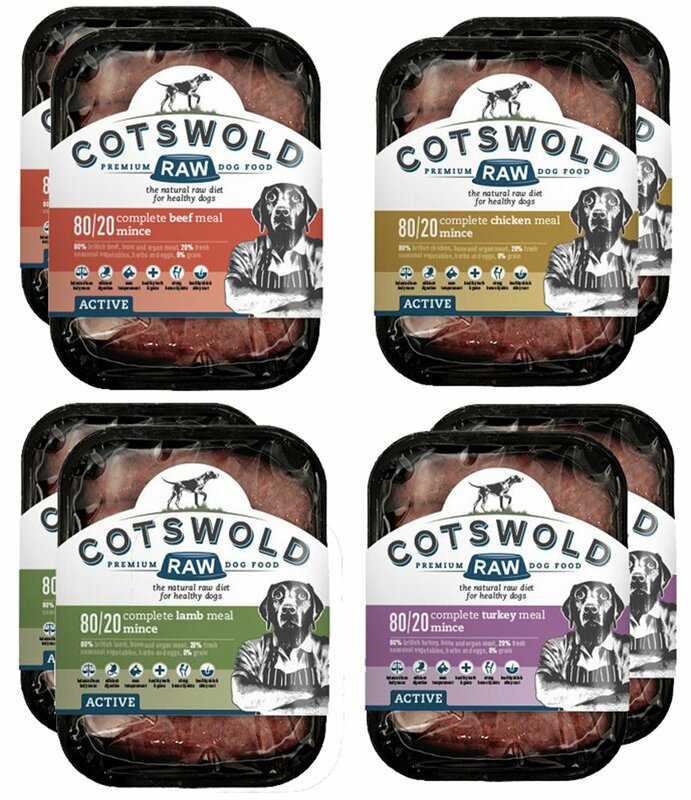 Cotswold Raw Active 80/20 Mixed Mince Adult Raw Dog Food Pack is a raw dog food made in the Cotswold’s using only fresh British beef, turkey chicken or lamb with bone and fresh seasonable vegetables. Cotswold believes this ancestral diet is key to canine diet. A dog’s digestive system varies greatly than our own, for them a raw food diet works best. Dogs were in existence long before man created processed pet foods that are high in grains and other fillers. Both domestic and wild dogs as carnivores are anatomically built for eating meat. The 80/20 adult raw dog food deliver’s the convenience of a processed food with all the health benefits of a fresh, varied raw diet. Raw 80/20 contains only the finest, freshest, human grade ingredients and as a result your dog benefits from a food high in protein and rich in enzymes, minerals, vitamins and essential amino acids which are required for a happy and healthy life. Pack Contains: 2 x 1Kg Beef Mince 2 x 1Kg Chicken Mince 2 x 1Kg Lamb Mince 2 x 1Kg Turkey Mince. DIGESTION: Switching to a raw food diet is for the better for your dog because it likely will excrete less as the food your dog is now ingesting is being properly used by the body, thus resulting in less waste.